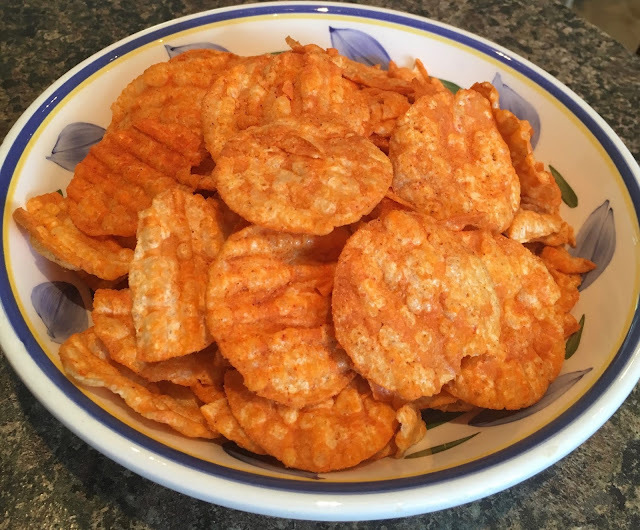 I have had regular Popchips before and I like the look of these Ridges they produce. This Crazy Hot flavour has a three chilli extra hot rating on the front of the packet. These Popchips Ridges are the usual low in calories, as they are popped not deep fried, so they are half the fat of usual crisps. Popchips take potatoes add heat and pressure until they pop. There are no artificial flavourings in the ingredients and they are gluten free. On opening the big sharing packet there was a strong paprika smell mixed with chilli and a mild potato aroma at the back of the smell. On looks as you can see from the photograph these well-rounded Popchips have a medium depth of ridge where the flavour can gather, and the seasoning of paprika is a deep orange. 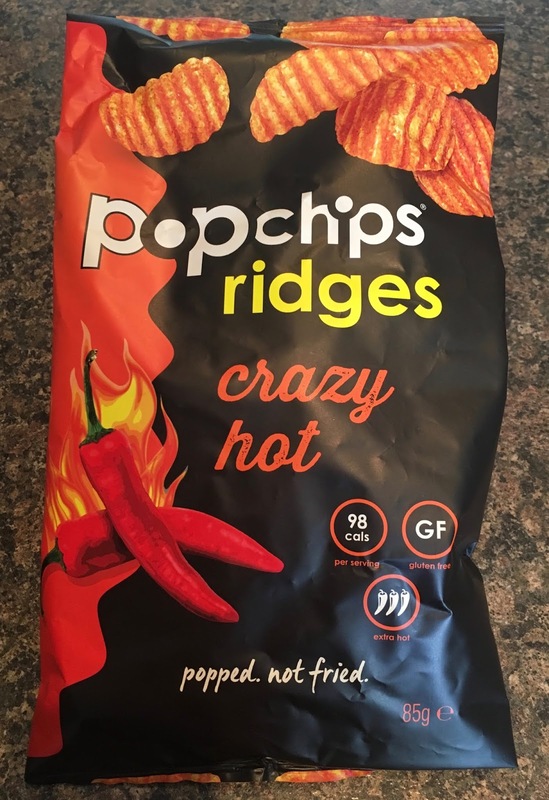 On taste there is an initial tomato and paprika flavour and the chilli builds in the mouth, so these Popchips are rather hot. The more Popchips I ate the tastier the tomato and paprika tang and the hotter the chilli. They are not uncomfortably hot though, but they are still hot and tangy. These Popchips Ridges not hot enough to put off scaredy-cats that might be worried by the three chilli rating and the "Crazy Hot" on the front of the packet next to the picture of the fiery chillies, because these are very tasty, but they are not too hot to handle! 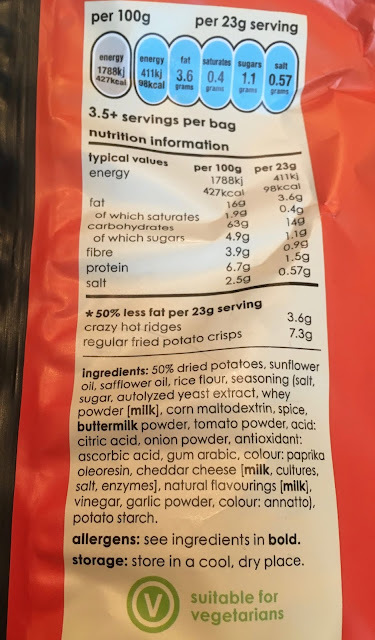 In the 85g packet there are 98 calories per 23g serving, having 3.6g of fat, 1.1g of sugar and 0.57g of salt. Please see photograph for ingredients.